For Francophiles, the word “Bastille” is likely to conjure up memories (or dreams) of fireworks and military parades, because the idea of la Bastille is inherently linked to 14 July – at least for English speakers. Chez les Français, not so much. 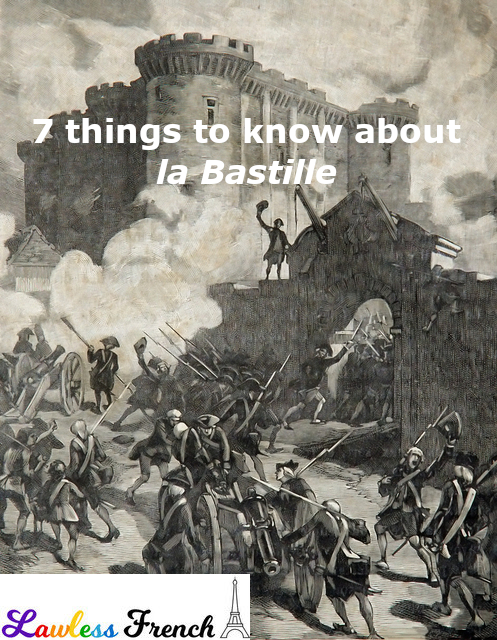 Here are 7 things you should know about la Bastille: the holiday, the prison, and the word itself. 1) C’est quoi, ce « Bastille Day » ? Though English speakers call 14 July “Bastille Day,” the French just call it le Quatorze Juillet or la fête nationale. The storming of the Bastille was a turning point in the French Revolution, yet the French don’t directly associate the former prison with their national holiday like Anglophones do. 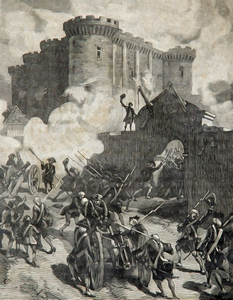 La fête nationale was established to commemorate not the Bastille, but rather la fête de la Fédération, which was held on 14 July 1790 to celebrate the first anniversary of the storming of the prison. So la Bastille is not entirely unrelated to le Quatorze Juillet, just sort of once removed. The French don’t typically wish each other a happy Bastille Day. At most, they might say bonne fête, but in my experience that’s rare, maybe because even though la fête nationale is a jour férié, it’s not necessarily a paid day off from work. Bastille is an alternate spelling of the word bastide, meaning fortification. The little that remains of the Bastille, such as a bit of the stone foundation and a rope ladder, can now be found scattered around Paris (and beyond), notably in the Concorde métro station and the (wonderful!) musée Carnavalet. Opéra Bastille was built on the former site of the prison, now known as Place de la Bastille, in 1989. The famous Bastille we all know and love was in Paris, but there’s another former prison named Bastille in Grenoble. Now that you know all this cool stuff about the prison formerly known as “bass till,” let’s go out and celebrate le jour de la Bastille le Quatorze Juillet!